White C4 manual, 143k miles @ £40k. There's now only one left: the rare, Works Turbo-bodied car, 97k miles - £105k! Prices are slooowing.. But for how long..? Flipping heck that's my old one...kept it a while before marketing it!! Had some real fun in 5 years of ownership can't believe it doubled up in the last 2 years since selling it and to think no one wanted to touch mine as it had been stood for three years prior wth rust inside the headlights!! Fondest memories as once it was warmed up ooo that red line was sublime...and getting to 157 mph with the sunroof vibrating and feeling its going to pop out.....not bad for a 20+year old banger!! 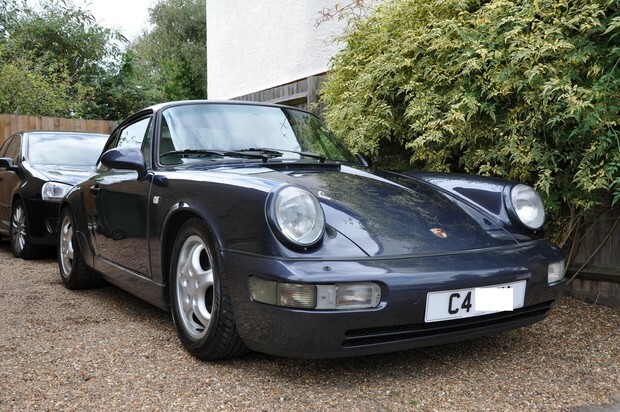 There is a nice 964 C2 (low miles) for sale at Silverstone this weekend. My guess is £60k plus. The 964 for me is the sweet spot for everything 911.Perhaps because I drove a few as new cars but they are just that perfect blend of classic 911 with enough modernity to make them an everyday proposition. But then what you think I've spent on mine the cost soon adds up. New rear lights, suspension, bushes, etc etc. It looked quite tidy although I didnt lift the bonnet or boot. Rear lights and reflector need changing and some paintwork needed doing. I didnt look at the history file so dont know about suspension and bushes but it didnt look like they had been done. That price was the hammer plus buyers premium, but not the VAT on the buyers premium. It does look very nice......but 8 service stamps in 28 years 🤔?